We round up six of the best modern car battery maintainers in our handy buyer’s guide to make sure your track car is ready to rock and roll when you are. Why do you need a car battery maintainer? When you’re heading out for the day, the last thing you want is a flat battery. We’ve all experienced that sinking feeling when we’ve left the headlights on overnight. In the morning, when you turn the key in the ignition, nothing happens. Vehicle batteries are inconvenient to replace and expensive. But this situation is completely avoidable if you invest in a car battery maintainer. You will no longer have to change the battery if it runs low or if it dies, there will be no need to jump start your vehicle. This essential tool will also help to condition the battery, leading to a longer life span and better performance. If you own a track car, drift car, classic car or rally vehicle and leave it unused for long periods of time, the battery can lose charge as it is not being topped up by the alternator. Car battery maintainers plug into your mains electricity socket and attach to the terminals of your vehicle’s battery. They are designed to charge a battery that has run low or to maintain one that is not being used, for example if your car is in storage during the winter. Today’s chargers have ingenious built-in features that ensure safe and efficient use. Please refer to our handy buyers’ guide below before choosing the best car battery maintainer for you. It is important to note that the negative cable always completes the circuit and the negative charging cable should never be connected to the battery without the positive also being connected. Headlights looking a little dim? Would you like that cool white glow back? Our best headlight bulb guide was written for you. The negative terminal is usually black and marked with a minus sign and the positive terminal is usually red and marked with a plus sign. You must never connect or disconnect the device without knowing which terminal is which! Performance: You need to choose the device that offers the best performance, charges efficiently and maintains the battery so you don’t have to keep replacing it. Diagnostics: Some chargers now include trouble-shooting systems that diagnose problems. These products help to prolong battery life. Voltage: This refers to the measure of the electric strength of the car battery maintainer. Most cars are 12 volts, so you need to buy a 12V charger. But if you want to charge other types of vehicles, then multi-functional 6V chargers are available, which will even fit jet skis! Amperage: This is the amount of current the charger is designed to handle or the amount of current that flows through it. The higher the amperage, then the higher the amount of current that the car battery maintainer can support and the faster it will be charged. But fast charging is not always a good thing. The ideal model should have the ability to select the correct charging mode. It should then be safe to leave the battery set to auto, so the car battery maintainer can choose the best rate of charging. Engine size: A bigger engine needs a bigger battery, which needs a more powerful charger! Check that the car battery maintainer is suitable for the size of your engine. Battery type: Lead acid batteries work with all types of charger but if you have a gel or calcium battery or an absorbent glass mat (AGM) or an enhanced flooded battery (EFB), then you will need to find a suitable alternative. Maintenance charging: Also known as “trickle charging”, this sends a small amount of electricity to your battery to keep it in check when your vehicle is in storage for a long period. Conventional charging: This sends power to your car’s battery to charge it when it has run low. It can take between 6-24 hours to fully charge the battery but generally it will be completed in ten hours. Engine start function: This is the equivalent of jump starting your vehicle. It takes a lot more power, so this function is usually found in heavy duty car battery maintainers. When choosing a car battery maintainer, safety should be at the forefront of your mind. Firstly, try not to overheat the battery as this may be dangerous. Secondly, be aware that car batteries contain harmful chemicals, so to release them will be hazardous. Auto voltage and amperage detection: this is designed to prevent the battery from overheating and being overcharged. Reverse polarity features: they will stop you from connecting the battery and the charger to the wrong terminals. Spark-resistant clamps: they block sparks from the car battery, thereby preventing fires and damage to the charger and the battery. You must also exercise caution when handling the battery itself, especially if it is damaged. This fully automatic portable smart car battery maintainer is lightweight and compact. Not just a “trickle” charger, its intuitive design incorporates a microprocessor that ensures it is always charged and ready for action, maintaining storage voltage. It is compatible with automobiles, bikes and rarely driven vehicles, such as ATVs, RVs, classic cars, golf carts and can even power up generators. There are four stages to its charging process: intialization, bulk, absorption and maintenance (float) mode. The device has a safety timer, so when it has detected that the battery is fully charged, it will switch to float mode and maintain your car’s battery. If it dies again, then the process will resume. It is reliable and innovative and its intelligent design means that it will never overcharge the battery, thereby avoiding damage. 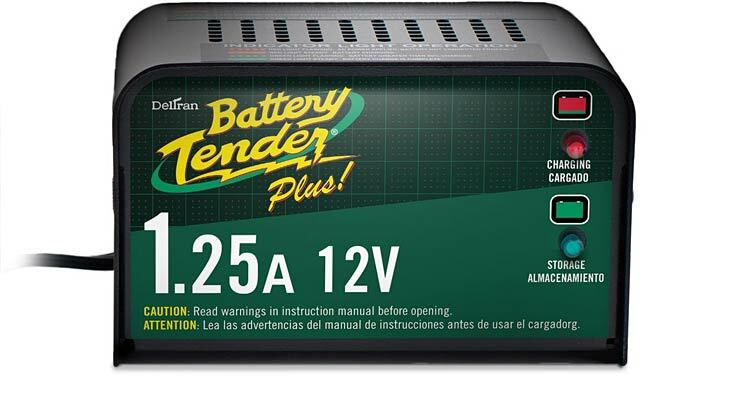 The Battery Tender Plus is one of the most trusted car battery maintainers on the market and it comes with a Ten-Year manufacturer’s warranty. It is strong enough to offset the drain on the battery from your vehicle’s electronics, keeping it at peak performance. This durable device is spark proof, reverse polarity resistant and water resistant. It can be used to revive a range of batteries, from lead-acid, flooded, sealed maintenance-free, absorbent glass mat (AGM) batteries and gel cell types. Its temperature is regulated to ensure optimum charge voltage according to ambient temperature. The two color LED screen will indicate what charging stage it is in and will not damage battery capacity, like many trickle chargers. It comes with a 12 inch output cord, ring terminals, alligator clips and a quick connect harness for difficult to access areas. Please note that this product is not energy compliant for the states of Oregon and California but affected citizens can buy the alternative model 022-0185G. 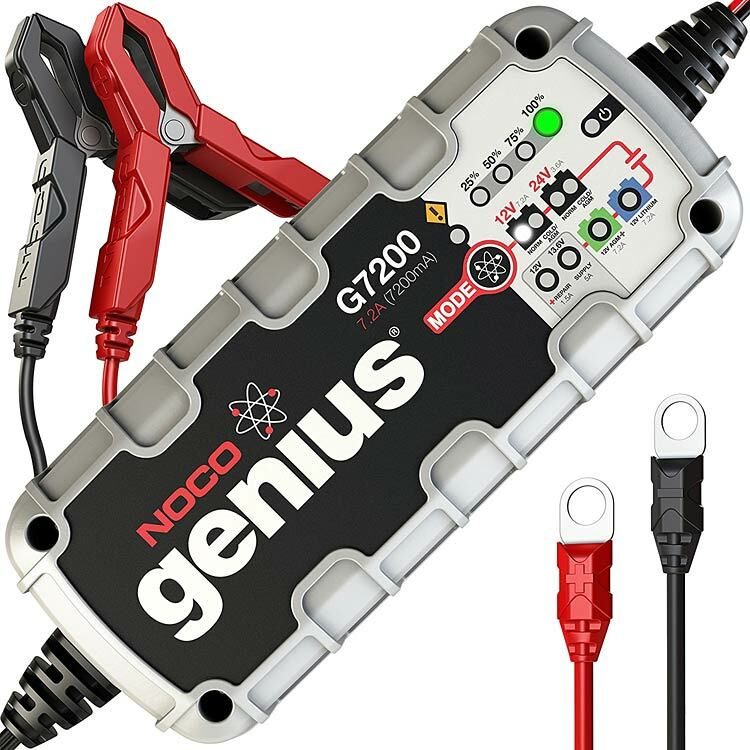 The NOCO Genius is one of the most advanced and safest car battery maintainers currently available. This versatile product is suitable for lithium-ion, lead-acid, automotive, garden, lawn, marine and deep-cycle batteries. It can be used to revive the batteries of rarely driven vehicles, such as snowmobiles and ATVs and be used on items as diverse as motorcycles, watercrafts and lawnmowers! The most impressive feature of this smart charger is that it can charge twice as fast as ordinary models. It can also power direct current (DC) devices, repair damaged batteries and it works well with CANBUS (Controller Area Network bus) electrical systems and micro-hybrid start-stop cars. Using its onboard microcomputer, this smart trickle battery charger monitors all the necessary activities needed for safe and efficient charging. It will automatically minimize consumption and guarantee optimal levels of protection. Its safety features include reverse polarity and overcharging protection and spark-proof technology. It is UV resistant and IP65 (International Protection) water resistant and can withstand jets of water being splashed on it. This ultra-reliable device can be left to charge safely 24/7 and is capable of revitalizing dead batteries. The NOCO Genius has a streamlined design and is compact and light enough for you to carry it around with you. It is fitted with external mounting holes and has a rubber base to stop it from slipping or scratching the surfaces where it is placed. Its state-of-the-art design incorporates intuitive LED indicators which give feedback on the charging process and other diagnostic information, even when the charger is set to maintenance mode. It comes with a lithium metal battery, battery clamps, eyelet terminals, and a Five-Year Limited Warranty. This high output wheeled car battery maintainer has various charging rates for different operations and is suitable for cars, motorcycles, tractors and trucks. It is not just a charger, it is capable of analyzing electrical and starting system issues, so this premium option is favoured by transport professionals and is perfect for fleet and commercial operations. The Schumacher SE can support up to 200 amps for emergency starting, which is ideal in the winter months. It also has an output of 35 amps for fast charging of batteries in one to three hours. The product features an impact resistant, color-coded meter, which allows you to view the charging status day or night. It has three charge states: a rapid 40-amp rate, 10 amps for fast charging and slow trickle charge of only 2 amps. This speedy operation means that a standard car battery can be charged within an hour or less at 40 amps. On the slower charge rates, it cannot be left for more than 12 hours. As this device is not controlled by microprocessors, you will need to manually operate it using the rotary switches and amp meter. You will need to monitor it, so it cannot be left unattended or overnight or it may reach full capacity and overcharge. 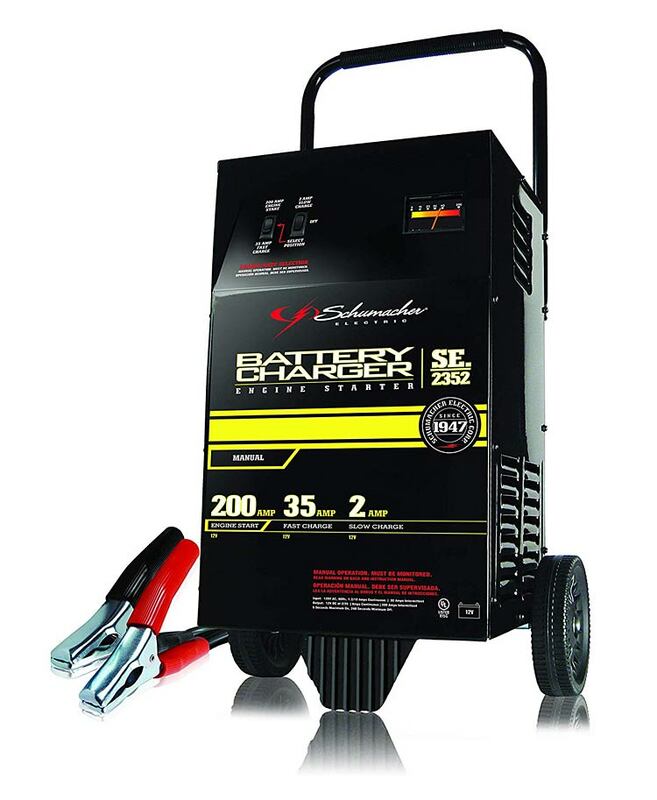 The Schumacher SE includes a heavy-duty transformer encased in a durable steel unit with a handle and wheels for ease of movement. It comes with clamps ensuring a solid connection and a six feet power cord and output cables, leading to a total reach of twelve feet. This is a fully automatic high frequency multifunctional charger, which is just as capable as reviving dead batteries as maintaining those in operation. It is capable of charging AGM, gel or wet automotive or marine batteries and is suitable for motorhomes, boats, jet skis, lawnmowers, ATVs and snowmobiles. The device is easy to work and is able to start a vehicle in around 90 seconds, as it includes a patented Engine Start Timer. You just need to connect the clamps to the terminals, then press start to begin the process. It features three charging stages and automatically switches from fast, to top-off, to trickle charge. You do not have to select the charge rate every time you use it, as it has an inbuilt capacity to do this. This indispensable tool also includes a battery reconditioning function, which helps extend battery life, by removing sulfate build-up on the battery plates. It incorporates an LCD screen to show the current charging state and as well as other battery diagnostics. To protect the battery from being damaged, it is also equipped with reverse polarity protection. The Stanley BC25BS also includes a patented alternator check to ascertain if it has maintained the correct battery level. This feature is Edison Testing Laboratories (ETL) Certified for safety and performance and has a One Year Warranty. The unit comes in a sturdy case with rubber over handles, metal clamps, inbuilt cord and cable wrap, so it is easy to manoeuvre and store. 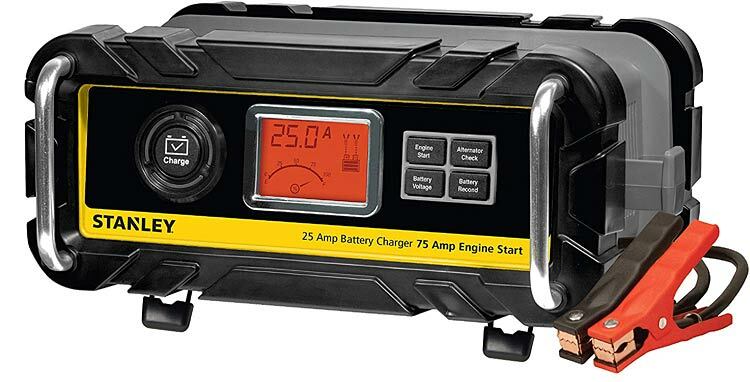 This heavy-duty car battery maintainer offers rapid, high frequency technology and multi-stage charging. It allows you to fill and maintain your battery without you having to change settings, select the type of battery or anything else. The charger simply decides what amperage to provide by reading the battery’s current charge. 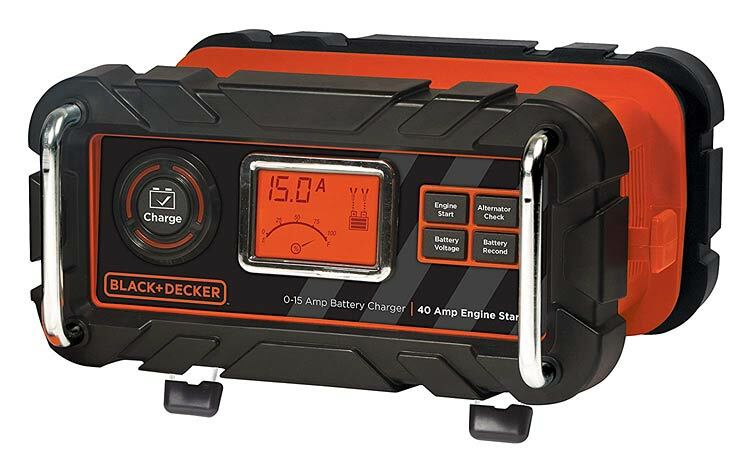 This completely automated fast charger from Black + Decker features a three-stage charging process: a high amperage fast charge to increase the battery’s capacity to around 80%, then a modulated charge where the amperage is steadily decreased to get the battery safely to about 98% capacity and then a float mode, where low amperage power is provided to bring it up to full capacity, maintain it and keep it from overcharging. It will fill and maintain any AGM, gel and wet 12 volt automotive and marine batteries and is ideal for reanimating dead batteries because it has a repair mode that reduces the build-up of solids inside the battery, thereby increasing overall capacity. However, it may take up to five days of continuous charging to revive a drained battery. The device includes a patented engine start boost mode which will start up most vehicles in up to eight minutes. It also incorporates a patented alternator and a battery voltage check, which are available to view on the large LCD screen. This is easy to follow and shows the battery and connection status. Because it monitors your battery and alternator at the same time, it will tell you if the clamps are not connected properly. The BC15BD works 40% faster than standard models, so it is guaranteed to give you peace of mind on your journey. The device is fully portable and allows you to charge the battery outside the car, if you leave it plugged into a power source. It provides reverse polarity protection and comes with a built-in cord, clamps and cable wrap. Now last but not least. If you are looking for a device small enough to fit in your handbag or briefcase, then you have come to the right place. 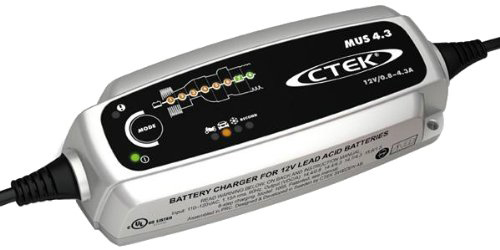 The CTEK 56-864 weighs in at just 1.6 oz but it charges as well as any full-sized model, as it utilizes state of the art technology. It is fully automatic with an eight-stage charging process and the charge lasts for a very long time. The product features a patented maintenance charge, maximizing battery life and performance. It is a perfect back-up to keep on your boat or RV, if you have used up too much power on other maintainers. It is splash, water and dust resistant, so it can still be used whatever the weather! The included leads are interchangeable and it can be mounted for permanent use. It is spark and short circuit proof and reverse polarity and overcharge protected, so it can be used safely with vehicle electronics. Its simplified design means that you can use it for multiple battery operations. Take pride in your cars appearance? Don’t forget to dress your tires. Our best tire shine guide was written for you. The CTEK 56-864 can solve a wide range of battery related problems, saving time and relieving your frustration. Its key features include: a patented desulfation process, which removes sulfate from the lead plates; a battery diagnosis that can tell if it can receive and retain a charge; a special reconditioning function which restores deeply discharged batteries; unique maintenance charging; an optimized charging mode for cold winter days and the charging of demanding AGM batteries. You can follow the entire charging process on the LED display. The charging unit comes with a Comfort Connect clamp, an eyelet, a storage bag and a Five-Year Limited Warranty. Motorists often think that jump starting their car will recharge its battery. An automobile keeps its battery charged when the engine is running but most cars are unable to recharge their batteries to full capacity once they have died. So, a car battery maintainer is a must buy, especially if you use an older vehicle. If you invest in this affordable product, then you will not need to buy several replacement batteries and you will save money on professional towing services. Thank you for reading this guide, I wish you safe and happy motoring!